Objective: The objective of the study was to determine and quantify the exposure to radiation of the non-dominant index for the surgeon performing sentinel lymph-node removal and to determine, if there is an irradiation risk imposed during the surgical procedure. 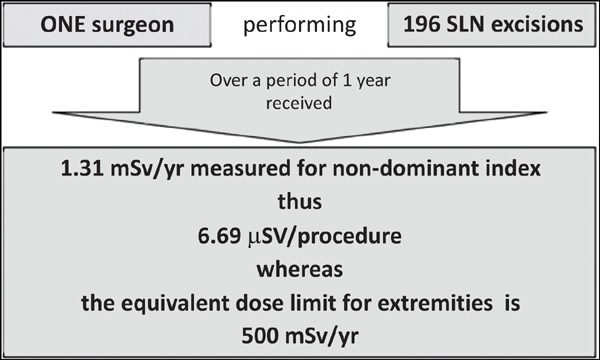 Method: We performed a study over a period of one year, where we evaluated the exposure of surgeon’s non-dominant index during 196 sentinel lymph-node removal procedures. The pharmaceutical was administrated via subcutaneous injection in four peritumoral or perilesional injection sites. The equipment we used consisted of EuroProbe3 for sentinel lymph-node detection and ring TLD dosimeter placed on the surgeon's non-dominant index. Results: The clinical distribution was: 104 melanomas, 84 breast carcinomas, 6 vulvar carcinomas and 2 penial carcinomas. The administered activity showed an average of 39.55 MBq (SD ± 1.96) Tc-99m nanoalbumin compound. The non-dominant index exposure ranged between 0.10 mSv and 0.13 mSv/month with a cumulative dose of 1.31 mSv/year, thus 6.69 µSv per procedure. Conclusion: The surgeon received a minimal dose for the non-dominant index. The values we recorded did not pose any additional concerns or restrictions, the exposure being under the limits and constraints established by regulations, close to the detectability limit of the dosimeter. The procedure is safe in terms of radiation protection, respecting the limitation and optimization principles. Keywords: Sentinel lymph-node, Tc-99m nanocolloids, non-dominant index exposure, radiation protection, limitation, gamma probe. Keywords:Sentinel lymph-node, Tc-99m nanocolloids, non-dominant index exposure, radiation protection, limitation, gamma probe. Abstract:Background: Sentinel lymph-node scintigraphy is a useful method for accurate staging of different tumors and a helpful tool in personalized therapy for oncological patients. The radiation exposure for surgical staff has been a concern since the sentinel lymph-node detection method was developed.